1) Last October, a combination of factors (hedge fund redemptions, crack down on naked short selling, and counterparty concerns on securities lending after Lehman's collapse) resulted in a drastic drop in short selling and securities lending. 2) This drastic drop in short selling and securities lending in turn created an enormous cash flow problem for Wall Street's prime brokers. 3) To solve this cash flow shortfall, prime brokers sold 2.5 trillion treasury IOUs to unsuspecting brokerage clients. 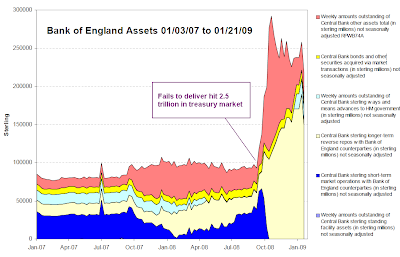 4) To reduce reduce these "failures to deliver" in the US treasury market, central banks, primarily the Fed, Bank of England, and the European Central bank, expanded their balance sheets and injected enough cash into insolvent prime brokers for them to settle the market. In essence, they monetized Wall Street's 2.5 trillion cash shortfall. While the graphics above are fairly self-explanatory, now that I am back in the States I thought it was time to provide some background information on why the securities lending would create such a cash crunch for Wall Street's prime brokers. With that in mind, eSecLending explains the steps that take place in a securities lending transaction. Q3 Briefly summarize the steps that take place in a securities lending transaction. 1) A borrower (e.g., a broker-dealer or bank) locates a specific security. 2) A lending agent negotiates the terms of the loan with the borrower to include price, rebate rate and in some cases, duration. 3) For loans of US equities, cash collateral is delivered at 102 percent of the market value of the security; loans of US fixed income securities, cash collateral is delivered at 102 percent of the market value of the security to include accrued interest to the lending agent. In lending programs in volving loans of non-US securities, the margin required on collateral is 105 percent. 4) Securities are delivered to the borrower upon receipt of collateral. 5) Cash collateral may be invested in a separately managed account, in an investment pool managed by the agent or in an external fund typically in short-term instruments within the investment guidelines of the lender. 6) A negotiated portion of the cash collateral interest earned on the reinvestment is paid to the borrower as a rebate. 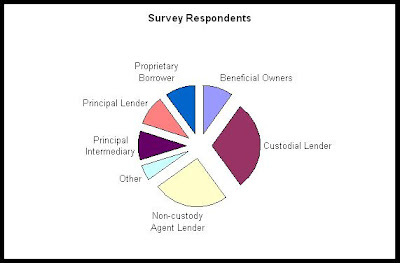 7) Out of the remaining portion of the cash collateral interest earned, the lending agent is entitled to a percentage as negotiated between the lender and the lending agent. Wikipedia explains the hypothecation of securities in capital markets. Hypothecation and re-hypothecation, respectively, are commonly used to describe the means by which securities brokers and dealers first extend credit on margin to their customers using pledged securities as collateral, and then pledge the client-owned securities held in the client's margin account as collateral for the brokerage's bank loan. In this example, hypothecation describes the posting of collateral to secure the customer's obligation to the broker; rehypothecation is the pledging by the broker of hypothecated client-owned securities in a margin account to secure a loan to the broker from a bank. This common use of the terms hypothecation and re-hypothecation is technically inaccurate, since the pledgee of the securities collateral, in the case of the broker, may be deemed to have possession of it. While rehypothecation is not permitted in some jurisdictions, it is common practice in the United States, generally under the terms of a written collateral agreement that explicitly permits it. In addition to the re-hypothecation of a securities broker-dealer's collateral by re-lending it or posting it as collateral for one of its own obligations, another means of re-hypothecation is the repurchase agreement (or repo). In a two-party repo agreement, one party sells the other a security at a specified price with a commitment to buy the security back at a later date for another specified price. Overnight repos, the most commonly used form of this arrangement, comprise a sale which takes place the first day and a repurchase that reverses the transaction the next day. Term repos, less commonly used, extend for a fixed period of time that may be as long as several months. Open-ended term repos are also possible. A so-called reverse repo is not actually different than a repo; it merely describes the opposite side of the transaction. The seller of the security who later repurchases it is entering into a repo; the purchaser who later resells the security enters into a reverse repo. Notwithstanding its nominal form as a sale and subsequent repurchase of a security, the economic effect of a repo is that of a secured loan. The Financial Times reports about the bankruptcy of Lehman's European operations. There are two basic forms of insolvency. The first and more common is cashflow insolvency. This is when a company finds itself unable to pay its debts as they fall due. The second is balance-sheet insolvency, in which liabilities outweigh assets. Lehman's European operations fell into the first category. Like many global corporations, the bank swept all the cash from its regional operations back to New York each night and released the funds the next day [Wow, another insane banking practice I was unaware of]. The Friday sweep had taken about $8bn out of London. Without cash, the business could not meet its financial obligations on Monday morning. A thriving business of more than 5,000 staff and investments worth billions of dollars was suddenly flat broke. Lomas and his team had learned about the nightly sweep on Sunday afternoon. After the 11pm call, they knew they were in a race to get the legal order that would appoint them as administrators before the London markets opened. Every day, Lehman dealt with thousands of companies, other banks and investment funds. Opening another day's London trading therefore ran the risk of destabilising the world's markets. Equally pressing, trading without the cash on hand to meet obligations — technically, trading when insolvent — is against the law. The juddering halt caused by the bankruptcy meant that the previous three days' trades were not fully settled. They weren't even fully recorded in the bank's systems. This wasn't an unusual time-lag, but one not helped by the fact that trading volumes had simultaneously shot up because of market panic, caused in part by fears about Lehman's health. The unsettled trades caused chaos in the markets as stock exchanges began to work through the deals to reach settlement. The securities traded by Lehman were simply left hanging during some of the most volatile days ever seen in the markets. Then there were the cancellations, where counterparties such as banks or hedge funds with whom Lehman had traded rushed to trigger legal clauses to extricate themselves from some deals. Thousands of e-mail cancellations hit the bank. Either for itself or its clients, the bank held billions in securities such as stocks, currencies, commodities, bonds and various derivatives. 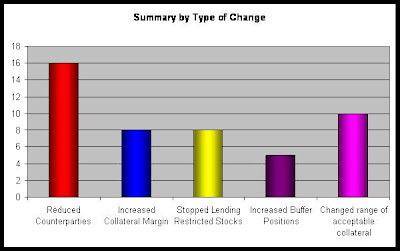 On Friday, Lehman traders went home comfortable they had protected their risk on these holdings. Monday brought the realization that the broken deals meant many hedges were no longer in place: the bank now had a book of holdings at risk of being crushed by the wild market swings. B) Credit default swaps (to hedge bonds). These hedges can all become worthless in a second, as shown by Lehman's collapse. Worse, most investors have NO IDEA WHO THEIR COUNTERPARTIES ARE FOR THESE HEDGES. Despite insane counterparty risks inherit in "hedges", especially options, many investors continue to use them out of greed because of (while they work) the leverage they offer. It's all complicated further by a process known as rehypothecation, which affects a substantial proportion of the hedge fund assets held by the bank [This is the true killer]. In these cases, the funds pledged collateral (usually stocks or other securities) in return for a loan, while agreeing to the bank's putting that collateral back in the market to make extra profits [Lehman used securities in its clients accounts to take out secured loan]. With the music stopped, the hedge funds owed Lehman money in exchange for the collateral. To honour that, Lehman must itself go back into the market and unwind deals in which it reused the assets, paying out cash to get them back. Below is a batch of entries from Roy Zimmerhansl's blog, Stock Lending Today. Reading these entries should provide a good idea of what happened in the securities lending world after Lehman's collapse. There is no question that [hedge fund] redemptions are having an impact and will do so increasingly. The deleveraging of the investment banks, the Fund of Fund managers and the hedgies themselves all require selling and closing out shorts [This closing out of short positions is what created a massive (2.5 trillion) demand for cash.]. All forces that are contributing to a massive shift change in the demand side of the business. Let's look at this in the context of securities lending at the moment. Everyone in the market is experiencing funding issues whether you are a hedge fund or investment bank looking to borrow stock or cash, or a lender trying to find someone to borrow your stock. If you are a lender that has found someone to borrow stock and give you cash, then where do you invest that cash? Measure your firm's approach over recent weeks and also look at the attitude of your clients and counterparties. "Our securities-lending program remains strong," a spokeswoman for the Boston company said. "We have not experienced any losses, and there are no restrictions on normal course transactions within the lending funds." We have also seen recent stories about Northern Trust and Bank of New York Mellon in the cash reinvestment area. The credit crisis of last year has morphed into the liquidity crisis of today and is the most pressing issue facing the financial markets. Watch closely as this storyline continues to develop. Who could have foreseen at the start of 2008 that we would be here today. Being an overachieving Goldman alumnus, Hank Paulson clearly wanted to run more than just Goldman, so his master plan turns out to be that he wanted to run the entire US banking industry! "Customers are migrating away from its premier prime brokerage business due to deleveraging and concerns around the protection of client assets." While to an extent this is MS [Morgan Stanley] specific, it is also a comment on the concerns and issues facing the PB [Prime Brokerage] industry as a whole. Everyone is thinking about how the world has changed in recent weeks and the implications for their business. I'm a sheep, so I'm wondering about that as well. One of the most important and obvious issues for securities lending is that of counterparty risk. I have always argued that this is the single most important risk issue. I make this statement on the basis that if the borrower is still in business, you can always get more collateral. However, if the borrower if bust, you are burned. It doesn't matter if you have the highest quality collateral or how much haircut you have taken. If the shop door is open, you can deal with any issues. If the sign says "Closed", you might be out of luck. The highest priority that everyone has had over the past month is sorting out the aftermath of the Lehman failure. No one in the business has wanted to go through the past month of turmoil. Even if lenders had enough money left over after liquidating their collateral to repurchase the securities on loan to Lehman, the stress during the period was tremendous and people just don't want to have that happen again. So where are we now? The big three prime brokers from January 2008 - Morgan, Goldman and Bear - are now banks (or part of banks). These banks are now part of a bigger group of semi-nationalised or completely nationalised banks that are active securities lending market participants. What does this do to the counterparty credit assessment process? I had dinner yesterday with someone who's view is that essentially counterparty credit risk is no longer a concern for those quasi-government entities. I don't necessarily agree with that point (in fact I don't agree with it at all [me too]), but there is no question that the credit department will view those firms differently today than they did last Wednesday. The credit-turned-liquidity crisis continues to undermine the market, with a not-unexpected negative impact on securities lending. I've mentioned cash reinvestments in previous posts, and will continue to do so. My fear is that the fallout from losses - whether absorbed by agents or accepted by beneficial owners [it was absorbed by central banks, mainly the Fed, Bank of England, and the ECB] - will have a bigger influence on the securities lending business than any other single factor. Earlier this week the US Fed announced its Commercial Paper Funding Facility which is designed to help relieve the freeze in the money markets and free up liquidity. GE, the biggest issue of commercial paper in the US has subsequently announced its intention to participate in the program. I noted recently that one lender had notified clients of the potential for in-specie return of collateral to beneficial owners under certain circumstances and I have to admit to being surprised. Looks like I shouldn't have been. I have been hearing all week that this practice has become more common in recent months. The overwhelming, vast majority of assets in the reinvestment programs will mature and satisfy their initial investment criteria [if the dollar collapses (it will), these assets will be worthless upon maturity]. The problem is the wider market. Any sales from reinvestments are done in a market that doesn't want to buy any paper, from anybody, except at fire-sales prices. Losses generated from such sales, as well as defaulted paper have led to more reports over the past few days about institutions suing agent lenders. Let me first say that I don't know any specifics of any of the situations other than what I read in the press. *** Were the clients of the securities lending programs aware that the investments were made at their risk? *** Did the clients approve the reinvestment criteria? *** Were the investments made by the agent in line with the client approved criteria? *** What processes and procedures were followed in disposing of any assets that were as a result of client withdrawals or borrowers returning stocks? *** How were any assets in default handled? *** Did clients and agents discuss the impact of forced sales of collateral? In the mid-90s there were some losses suffered as a result of cash collateral reinvestments. These issues brought the subject of cash reinvestment risk front and center in the minds of beneficial owners and lenders. That sparked debate, discussions, program reviews and no doubt a number of changes. This is not a new subject and the majority of clients in programs today were probably lending back then. Then, like now, many assets that were loss-generating on a mark-to-market basis simply needed to be funded to maturity [The imminent dollar collapse removes "funding to maturity" as a viable option]. Securities lending remains a low risk business [HAH, that is a good one. Unregulated securities lending creates massive systematic risk]. The current credit/liquidity/crisis situation we are in is a "once in a hundred year event", or "once in a lifetime" or "the greatest banking crisis in the history of mankind". Take your pick [This crisis was in big part CREATED BY out of control Securities lending]. This is one of the few businesses that beneficial owners can participate in with such a low likelihood of loss and that generates a positive return even in falling markets. SeekingAlpha.com Ron Logue, State Street Chairman and CEO: "None of our funds that support State Street Securities lending business has lost money for our customers. Due primarily to declines in the market, but also suspension or reductions in securities lending by some customers, we have seen assets in our lending program decline by approximately 20%. As a result, we have seen increased withdrawal activity from the collateral pools, but we have been able to manage these outflows in a manner that protects our customers from loss. The current spreads and volatility are expected to at least partially offset the impact of lower volumes." There is a clear conflict with the Bloomberg story quoting a Moodys report as saying "Investors are also pulling out of securities-lending programs because of losses by short-term debt funds their collateral is invested in" and the statement by Ron Logue. "For clients that invest directly or indirectly in certain of the collateral pools and seek to terminate participation in lending programs, we have required, in accordance with the applicable client arrangements, that these withdrawals from the collateral pools take the form of in-kind distributions of securities." "In addition to the impact on the market value of client portfolios, the illiquidity and volatility of both the global fixed-income and equity markets have negatively affected the ability of SSgA to manage client inflows and outflows from other pooled investment vehicles." That's the kind of thing that worries me. It also adds some clarity to the letter State Street issued to clients last week. In previous blogs I have made it clear that I feel counterparty risk is the single biggest issue for a lender to contemplate. Further, I think we are all in agreement that every market participant needs to take a step back from their existing securities lending business activity and re-examine their business from the ground up. I am absolutely not advocating that anyone stops lending in part or in whole. I believe in a free market and am against all of this government intervention, but even so, no regulator has asked the institutions to stop lending. The restrictions have been focused on the borrowers, and if regulators are trying to target anyone, that is the correct focal point. Nevertheless, the market is in the midst of unravelling the biggest default that we have experienced in our business and it is a seminal point in the history of securities lending. *** It is no doubt a difficult time for firms at the fringe. Just about every respondent reduced the number of counterparties they deal with. *** The next most common change is to the range of acceptable collateral [This explains the spike in demand for treasuries: they became the only form of acceptable collateral]. I d idn't go into any more detail in the survey, but presumably there was a "flight to quality". *** Forty percent of firms stopped lending restricted stocks — even though there was no legal requirement to do so. 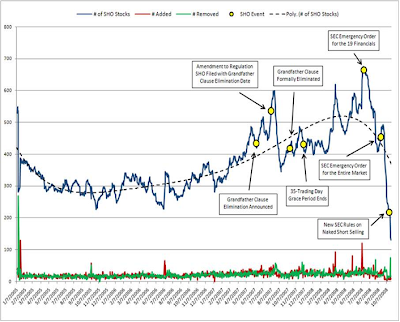 This reinforces the anecdotal evidence of a reduction in availability of these stocks and an increase in recall activity. 40% of firms took actions that were not required by regulators and may have had a negative impact on the liquidity of the markets [no kidding?]. *** Collateral margins were also increased by forty percent of respondents [This helps explains the desperate need for cash which resulted in 2.5 trillion treasury IOUs]. An obvious and interesting follow-on question is whether firms increased the margins across the board or on a counterparty specific basis. Also, more detail on the increased levels by collateral type might be useful. The whole spectrum of hedge fund/prime brokerage/securities lending industry is about nothing other than making money. As we are in reporting season, we can start to see the impact of the continuing liquidity crisis, market weakness and the Lehman default. When I was first involved in the securities lending business all those centuries ago, I dreamed about the day where it was important enough to be mentioned in my company's Annual Report. It now regularly does appear in company reports but not the way I had hoped. The latest is the ANZ Annual Report where the CEO mentions the review of their business and the actions against 13 staff. Ummm, maybe "below the radar screen" is not such a bad place to be. *** Securities lending is revenue generated from otherwise static assets [by creating counterparty and collateral risk]. The investment decision itself has dramatically greater scope for gains and losses, whereas under normal circumstances, securities lending returns are only positive. *** Lending activity is fully collateralized and is marked to market on a daily basis. *** Your primary risk is counterparty and participants have complete control over their selections. *** It is also possible to have further counterparty protection through indemnifications issued by many of the top agent lending organizations. An Odd Day - Corrected Version! I wasn't aware of this, but in the pre-budget report in the UK last week there was a provision stuck in there for relief from stamp duty on transactions whereby a stock lender is disposing of collateral to acquire replacement shares as a result of a borrower default. It pains me to say so, but this is a helpful and sensible provision from the government. What an odd day - I'm saying something nice about Darling Darling. The Pensions & Investments article referred to quotes a corporate pension fund executive as saying he was surprised at how much long dated paper was held in the collateral pool for his loans [Stocks were lent out and sold, with the proceeds being placed into long dat ed paper. This process mirrors what happened with gold leasing, and explains why long term interest rates have fallen during the last two decades]. Surely people check their investments from time to time and cash collateral re-investment should have been the same. "This for many will no doubt be a contentious view point but ABS and MBS were seen as good investments for many years and by the size of the market issuance this view was held by others not just Securities Lenders. Risk managers and investment professionals believed they were appropriate investments as did rating agencies who rated them AAA [AAA = toxic]." I had a number of conversations with people (including other consultants) before going to Arizona, then at the conference and since the event. Many people feel they are trapped in their [securities lending] programs and are forced to carry on as before. While it may not be simple or straightforward to make changes, and it may not be possible for most or all your program, there are things you can do to alter your profile and risk. Again, talk to your providers first, and think outside the box. Guest Blog - Cash Re-investment: What have we learned? What have we learned: Well it's certainly no free lunch!!! It's important to understand cash reinvestment is not securities lending — however as a product associated with securities lending it cannot be disassociated as some try to do especially when things go bad! The plan as always is to have very liquid, highly rated securities. Generally the primary objective as stated at the top of investment guidelines is to protect principal value of cash collateral received and maintain adequate liquidity. Outlining the benefits to a client is obviously important and is generally the easy part. Making sure all the risks are communicated and understood is the critical part. Cash collateral reinvestment is an option and not obligatory when participating in securities lending. For those clients choosing cash reinvestment, they should agree and sign the investment guidelines. There should also be a clear section on the risks and health warnings! Cash reinvestment introduces leverage to securities lending that would not be the case if non-cash collateral were taken. Ultimately cash reinvestment is about risk and reward. A lot of money can be made from this strategy but the risk will climb accordingly! It's down to the appetite one has for the risks. Clients invested in a variety of asset types, interest rate durations, maturities and credit qualities. Credit qualities were at the high end. As per RMA Q308 survey 91% of investments were AAA/AA/A1/P1. However with a mixed asset class of CP, ABS, Corporates, etc., how easy has it been to sell any of these securities with no loss? As clients have considered exiting lending programs, whether being for economic reasons, not wishing to be associated with short selling, or concerns over the liquidity risk, they have come to realise it has been difficult to withdraw due to the illiquid nature of the investments. This is no different to the crisis experienced in Money Market Funds in the US - as investors look to get there money back, some MMFs have to put a freeze on withdrawals from the funds. They have a certain amount of cash but are unable to sell investments without losses! Another major problem has been comingled collateral pools. Are they beneficial? Can a client exit easily? [no] In good times yes but should any investor want to get out now then there are concerns about disadvantaging the remaining investors. For example when a client leaves they take some of the cash portion of the pool! Should an asset go bad after a client withdraws, the remaining clients are left with the problem. When a security is sold either at a loss or profit who is attributed the proceeds/ losses and how? How do pools deal with these situations to ensure a fair treatment for all participants? The benefits are economies of scale and improved liquidity. Again pools have performed well until the crisis but now they are a source of concern to investors. Securities Lending Guest Article - Operational Risk - Under Control? Prior to the Lehman default in September 2008, the risk of loss as a direct result of over/under collateralisation was generally thought to be very small. This was because excessive exposure only has the potential for loss if the counterparty defaults. Now that there is a much greater level of awareness of counterparty risk, market participants are making significantly greater efforts to ensure their exposure is kept to a minimum. However, agreeing marks/exposure with a counterparty without automation is particularly difficult as every loan and collateral position has to be valued usin g an up-to-date market price/FX rate and margined appropriately. Significant differences in any of these components will cause problems in the marks/exposure process. Terrific news from the London Pension Fund Authority - they are returning to the securities lending market. 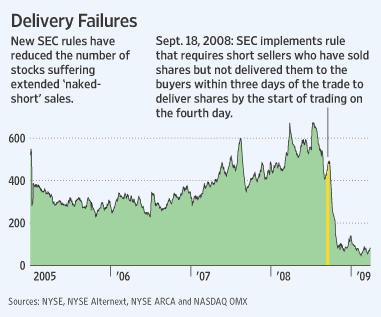 Their trustees had decided that there was no evidence that short selling was "evil". According to the report the fund generates income of �700,000 per annum from lending securities. A nice positive earner, particularly in these markets. ... you may recall from my post in February that Prime Brokers, along with just about everyone else in the financial services industry are suffering from a reduction in resources of all types. This includes everything from a limitation of leverage available to funds through to staff on the trading desk that cover their hedgie clients. So obviously what they try to do is focus on the funds that make the money or have the best potential to do so in the future. At the same time as resources are being cut, PB's costs have risen and they have typically passed them on to their clients. Stock loan fees have increased. Internal funding rates at PBs [Prime Brokerages] are up across the board. Banks do everything they can to avoid giving cash as collateral, yet at the same time, many lenders are more desperate for dollars then ever. 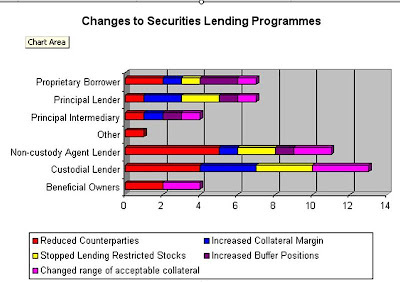 Further, lenders have tightened their list of securities collateral acceptability, making it more expensive to borrow securities. An old hedge fund client of mine recently asked me about the good old days when convertible bonds were good collateral. Now you can see them piled up in the corner gathering dust. Well, not really, but you get the idea. So for the majority of end borrowers, stock borrowing fees (along with other PB charges) have increased over the past year to eighteen months. *** If you are driving down Wall Street and find yourself heading towards Sh*t Street, when someone offers you a lift in the opposite direction it's generally a good idea to take it, and not hold out for "something better" to come along. My reaction: When Wall Street's prime brokers met redemption request (from hedge funds closing out their positions) with cash from new investors (those flocking to treasuries out of panic), they were running a ponzi scheme in every sense of the word. The only difference between what Bernie Madoff did and broker-dealers selling 2.5 trillion imaginary treasuries is the government's response. Authorities discovered two ponzi-scheme related cash shortfalls last October: $50 billion in the case of Madoff and 2.5 trillion in the case of Wall Street's prime dealers. The result? Madoff was thrown in jail, and Wall Street was given an ungodly amount of printed money. Madoff should complain about his unfair treatment. 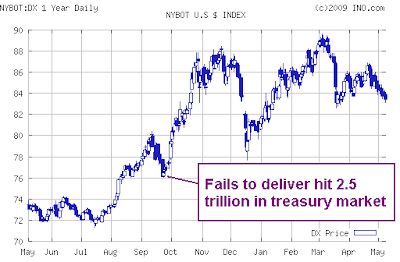 4) Broker-Dealers would not have sold treasury IOUs if they had any other source of funding available. This confirms that they are truly insolvent and have virtually cash on hand at all. We can now add "unwinding securities lending programs" as the tenth reason interests rates are headed higher. This entry was posted in Background_Info, Currency_Collapse, Federal_Reserve, Market_Skepticism, Wall_Street_Meltdown. Bookmark the permalink. "As in housing, many commercial properties have mortgages that were bundled together in pools, sliced and diced and instead of being held by banks were sold to investors as bonds and securities. Thousands of these commercial mortgage-backed securities, or CMBS, are reaching their maturity dates over the next three years. Ten-year mortgages issued in 1999 and 2000 start coming due late this year, and five-year loans issued from 2005 to 2007 come due early next year. 'If you stop and think about what is coming up for maturity over the next couple of years, either on the banks' books or CMBS, there is going to be a day of reckoning as those loans mature and they have to be rebalanced and reset to today's underwriting standards,'' said Blakely, who worked 17 years as a bank regulator followed by 17 years as a bank executive and risk officer. "''On the street, the rumor is it is coming and it's going to come fast and furious. Some people are predicting September,'' said Paul Waters, a New York-based executive vice president of brokerage operations in North America for NAI Global, a top-five commercial real estate brokerage with operations across the globe." Are commercial mortgages the next crisis? The renewal date is fast approaching for thousands of commercial mortgages valued at hundreds of billions of dollars. Even those of us who don't know jack about economics can still look at these charts and see something is very wrong.